Lexus said the new IS 250 will get around 30 mpg on the highway and 24 mpg combined. Lexus has set the base price of the 2014 IS compact sport sedan at $36,845, including shipping, an increase of $885 from its predecessor, Lexus said. In contrast, the top-level IS 350 with all-wheel drive starts at $42,595, including shipping, which is 2.1 percent lower than the model it replaces, Lexus said in a statement this week. The pricing makes good on Lexus’ guarantee to keep the base price attainable for consumers “by narrowing the gap between the 250 and 350,” a Lexus spokesman said. Lexus said it made more than $1,400 worth of previously optional equipment standard for the 2014 IS models. Standard features include high-intensity discharge headlamps and L-shaped LED daytime running lights, paddle shifters, a dual-zone climate-control system, a color 4.2-inch multi-information display and 10 airbags. The multimedia system delivers real-time traffic and weather information without subscription, a first for the industry, Lexus says. All IS 250 models will get a 2.5-liter V-6 engine delivering 204 hp. Lexus said the new IS 250 will get around 30 mpg on the highway and 24 mpg combined. All IS 350 models will feature a 3.5-liter V-6 engine that makes 306 hp . 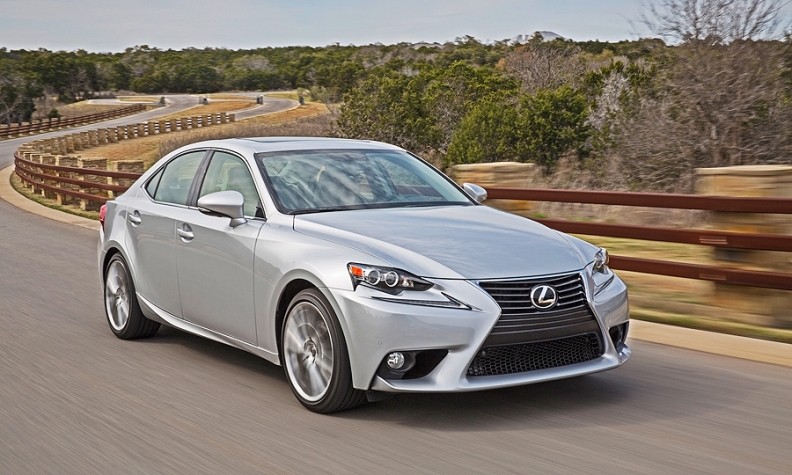 Lexus said IS 350 models will get about 28 mpg on the highway and 22 mpg combined. Only automatic transmissions are available. The IS 250 and 350 also are available in three packages: premium, luxury and F sport. Last year, Lexus sold 27,708 IS units in the United States, down 7 percent from a year earlier.